Pacific Paddle Games: Here are the heat draws for Saturday’s quarters and semi-finals. Good morning from Doheny State Beach in Dana Point, California, and welcome to the 2017 Pacific Paddle Games presented by Salt Life. The biggest race of the year is set to be a cracking showdown once again, with a stacked field of international pros and hundreds of weekend warriors set to take over this iconic location. Saturday is qualifying day in the pro divisions: The men’s quarters and women’s semi-finals start at 1:45pm with the top finishers heading through to finals day on Sunday. There will be 4x heats for the pro men with the top 10 from each going through to the semi-finals on Sunday. The pro women will jump straight into their semis on Saturday afternoon, with the top 8 from each of the two heats going straight into Sunday afternoon’s grand finale. Remember you can watch the whole show LIVE over on SUP the Mag’s Facebook page this afternoon. We’ll be on air from around lunchtime building up to the start of the pro men’s quarter-finals. Take a look at who’s racing down below. All the heats seem fairly evenly stacked (seeding was based on last year’s PPGs beach race results), though if I had to pick a “heat of death” it would probably be the first one in the men’s. 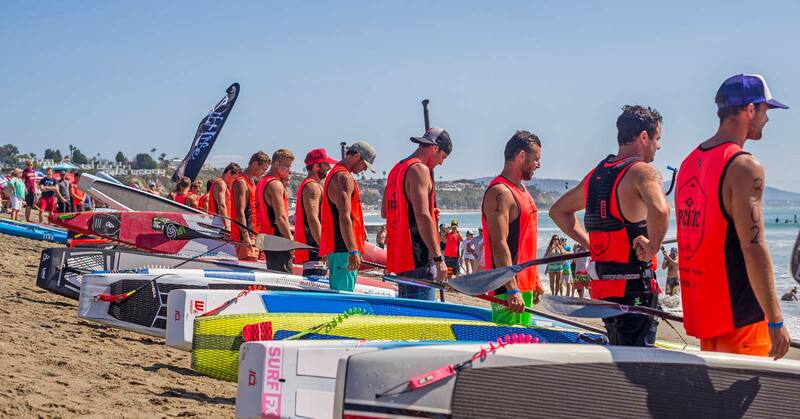 Note: The “trials round” on Saturday morning has been skipped, with all paddlers in the men’s pro division going straight into the quarter-finals. There will be no repechage or second chance round.